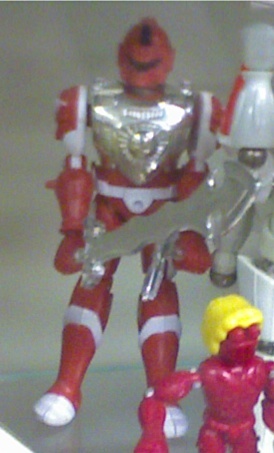 This particular clone has a red and white body, a different head that than RF, but has some common parts like the armor and the sword. Unlike RF, who turns into a big bird, a falcon perhaps?, this one turns into a motorcycle. Kinda neat. A second clone I have is in green and is more Red Falcon like than the red one. Like RF, this one has wings and body armor. It also shares the standard RF head. Unlike RF, his body armor has two guns attached to it and he packs a couple of pistols. In Adam’s post, he mentioned a black RF clone. I don’t have one, and haven’t seen one, but there is no reason to believe it might not have been part of this line of knock offs. From what little I do know these guys were sold in discount toy stores and places like Big Lots. May have been sold in drug stores. 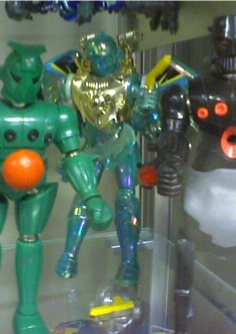 Overall, the toy quality is poor, but they do have magnetic ball joints like the Micronaut and Microman Magnemo toys. These pics were shot with my cell out of my toy case, so excuse the fuzzy quality. Previous PostTente not LegoNext PostWant to talk toys? As an addendum to Erik’s info, Howie Abrams (of the Abrams/Mego clan) worked for DSI when the Red Falcon clones hit Big Lot shelves. There’s a very real possibility that Howie had the original Red Falcon tooling and used them with slight modifications for DSI, who were most likely unaware that these magno designs and likenesses were copyrighted properties. Sun Lin toys continued to market these worldwide, at least until 2006 or so, but NOT in the USA. . . Yes, there’s a black one. I only have two boxed RF clone samples (a red and a yellow), but I’ve amassed a large collection of eBay photos of the other variations. I think I remember seeing these many moons ago, in my teen years. I’m from a small town called Utica, NY and one of it’s claims to fame was home to the very first Woolworth’s store. We had one downtown for years, and I remember many trips to the toy department there, and seeing toys you wouldn’t see anywhere else. This was one of them i think. I also remember in the 80s seeing a Turok figure based on the DC character, later a famed video game character. They also had the Warlord and Hercules figures in the same line. Also, some super heroes I had never heard of in a line called The Crusaders. They ended up years later getting bought up by DC. There were figures based on The Shield, and The Fly. I never bought them. I figure who would want to play with guys you never heard of, and they were kind of cheap looking. Hindsight is a wonderful gif, huh? I’d forgotten about Eric’s site. Glad it is still up! Turok was awesome. Great games too. Would love to see the crusaders character toys! Just a correction, there. Turok is not a “DC character.” His likeness is owned by Western Publishing and he appeared in Dell/Gold Key comics during the Golden/Silver Age era and was resurrected in the 90’s under the Valiant & Acclaim banners. Okay. I assumed back then he was with DC because he was in the same toy line and Warlord and Hercules. Both of them were the DC character versions, and they were all listed on the back of the card.